First-quarter revenues at major U.S. and European investment banks surged to their highest level in three years thanks to particularly strong equities trading volumes, which also hit a three-year high, according to research firm Coalition. Total revenues at the world's 12 largest investment banks tracked in Coalition's IB Index stood at $43.9 billion as of March 31, up 3% on the prior-year volume of $42.5 billion. Coalition's sample includes Europe's Barclays PLC, BNP Paribas SA, Credit Suisse Group AG, Deutsche Bank AG, HSBC Holdings PLC, Société Générale SA and UBS Group AG, as well as U.S.-based Citigroup Inc., Goldman Sachs Group Inc., JPMorgan Chase & Co., Morgan Stanley and Bank of America Corp. Merrill Lynch. 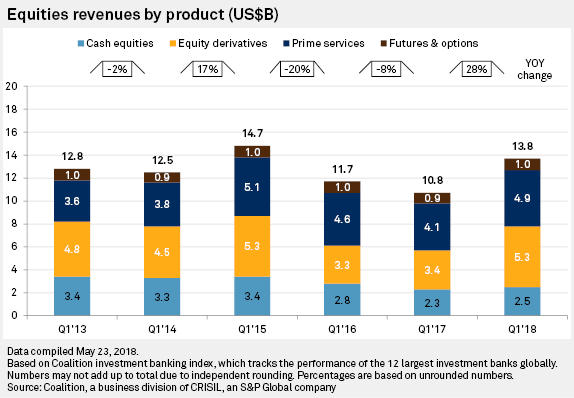 Equities revenues at these banks jumped by 28% year over year to $13.8 billion in the first quarter with higher volatility and increased client activity seen across all products. This was the best performance achieved since 2015, according to Coalition's data. Equity derivatives recorded the highest revenue growth rate in the period, of 56%, reaching a volume of $5.3 billion. Prime services also performed well, recording a 19% year-over-year rise to $4.9 billion. Revenues in cash equities and futures and options both rose by 10% year over year. Trading in fixed-income, currencies and commodities over the quarter delivered mixed results across products and geographies. 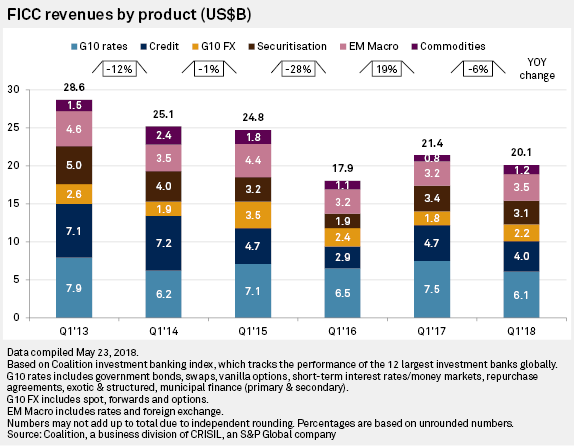 Underperformance in flow products, which are traded by banks using client money rather than own funds, hurt G10 Rates and credit revenues with the product classes recording double-digit revenue drops of 18% and 15% year over year, respectively. Securitization revenues also fell, by 8%, hit by weaker residential mortgage-backed securities trading. On the other hand, G10 FX and commodities recovered thanks to the improving market conditions and higher volatility. There was a wide disparity between FICC trading results in Europe and the U.S. over the first quarter, credit rating agency DBRS said in a capital markets research note May 23. Lower volumes of market activity in European FICC hurt the region's banks, which underperformed their U.S. peers. "In Europe after the initial spike in client activity in January, driven by increased market volatility, market conditions weakened in February and March, resulting in an overall modest quarter for European FICC," DBRS said. European banks with larger exposure to the U.S. market were better positioned in the first quarter, according to DBRS. 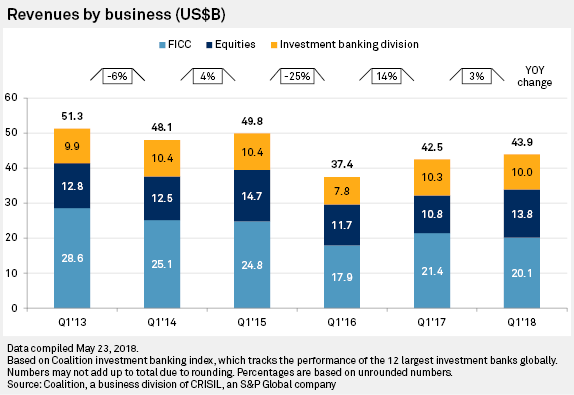 However, the agency added that "taking into account substantial differences in FICC trading conditions and a relatively high [prior-year] base for some of the European banks," it expects the performance gap between European and U.S. investment banks to narrow in the next few quarters. The high volatility in early 2018, affected revenues in the global institutions' investment banking division — which includes M&A advisory, debt and equity origination — as clients are less keen on closing transactions in uncertain markets, commentators have said. Equity capital market revenues rose moderately, by 2% year over year in the first quarter, while debt capital market revenues fell by 4% due to lower issuance of investment-grade and leveraged finance products particularly in the Americas and Asia-Pacific, Coalition said. Global debt capital markets had "a robust start of the year" totaling $1.89 trillion from 5,479 deals, according to Dealogic data. This was the second-highest first-quarter volume achieved since 2013 and the third-highest achieved in the past 10 years, Dealogic said. Nevertheless, deal pricing was very volatile with deal flow almost halving in February and at the end of March, as bond activity was hit by interest rate hikes and instability in stock markets, the statistics bureau added. M&A deal volumes dropped significantly in the Americas over the first quarter, offsetting the strong performance in Europe, the Middle East and Africa, and Asia-Pacific, with total volume amounting to $2.8 billion as of March 31, down from the prior-year $2.9 billion, Coalition said. Global investment banks earned 14% less in advisory fees in the first quarter of 2018 with the total global volume dropping to an estimated $5.4 billion, according to Dealogic. Nevertheless, dealmakers have lined up some $10 billion in fees from announced deals that are pending completion later in the year, Dealogic said. The M&A fee pipeline at the end of March was the second-strongest on record since the $10.2 billion booked in 2016, the completion rate of which was 77%, according to Dealogic. Globally, the volume of M&A announced reached $1.12 trillion, the best ever first-quarter result, beating the previous two records of $1.08 trillion in 2007 and $1.06 trillion in 2000, Dealogic said. Coalition is owned by Crisil. 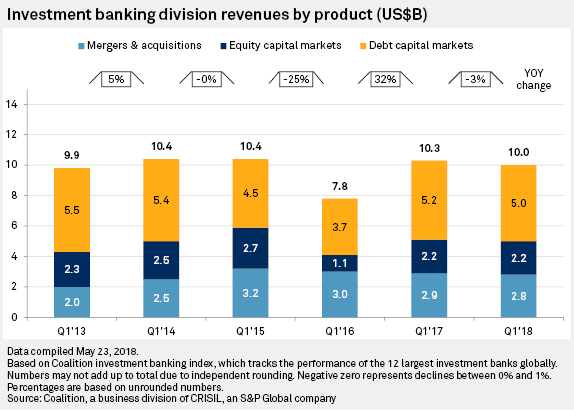 S&P Global Market Intelligence and Crisil are owned by S&P Global Inc.
Click here to read more on investment banking revenue in 2017. Click here to set up real-time alerts for data-driven articles on any region of interest.